The Livery lunch 2016 was well attended on a typical early English summer’s day in July, with rain and sun in equal measure, at the magnificent Cavalry & Guards Club on Piccadilly. 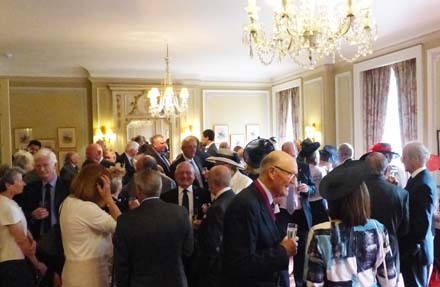 Guests, including the Master, Past Masters and Liverymen, together with their partners and families, sat down to a three course lunch after drinks. 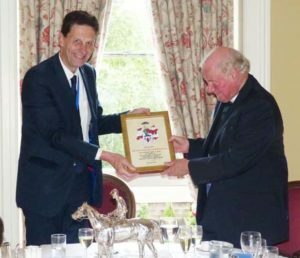 This year’s lunch was particularly noteworthy, as we were able to thank The Very Reverend Colin Semper who has retired after twenty-seven years as Company Chaplin. 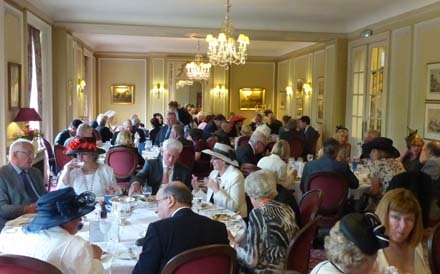 The sixty-five guests, a record turnout, arranged on seven tables enjoyed a splendid lunch. 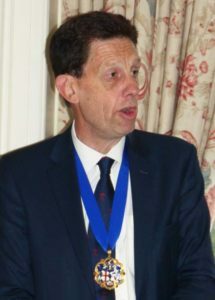 The Master, Peter Simeons, rose to express the Livery’s thanks on the contribution The Very Reverend Colin Semper has made both to the quality of the lives of those in the outside world but also to members of the Worshipful Company of Feltmakers. Indeed, the Master observed that the turnout was a record for a Livery lunch which he firmly attributed to thanking Colin for his selfless contribution. Colin Douglas Semper was born on 5th February 1938 and educated at Lincoln Grammar School, Keble College Oxford and Westcott House Cambridge. He was ordained in 1962 and became the Curate at Holy Trinity with St Mary Guildford. His career covered numerous appointments including Head of Religious Programmes for BBC Radio and Deputy Head for Religious Broadcasting, Provost of Coventry Cathedral and finally Canon and Treasurer of the Westminster Abbey, which allowed him to wear the distinctive red cassock. On his retirement from the Abbey he moved to Surrey and took up an Honorary Post at Charterhouse School and became a non-stipendiary priest at St Mary’s Frensham. He took up golf and played in a number of the Feltmakers’ golf days. Colin met his wife Janet on a blind date at Nutford House, a Hall of Residence of the University of London, and they married in 1961. They have two sons, Giles and Hugh. The first Livery function that Colin attended was the Mansion House Banquet in 1977 when George Rice was Master. 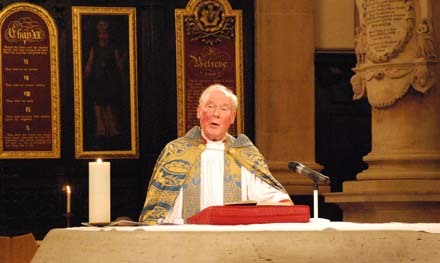 His next connection was as Honorary Chaplain during David Watling’s year as Master in 1985/6. During that time he became known to members of the Livery and when Canon Richard Tydeman retired, Colin was the natural choice to take over. Colin initiated the annual Feltmakers’ Carol Service, the first being at Westminster Abbey, and which is still celebrated. He has a natural wit and is a fine after dinner speaker. He now lives quietly in a beautiful cottage opposite the church in Frensham village, near Farnham. ‘Colin – You also have a wonderful talent for being able to relate historic bible readings to modern day circumstances and situations. For in excess of twenty years, and including a very thought provoking address at our Carol service at St Bartholomew The Great last December, you have provided support and guidance to the Livery, for which all of us are deeply grateful. Thank you so much, Colin, for all you have done for us all here today, and also for those who were unable to attend. I want to confirm, Colin, that we look forward to seeing you frequently in the future – this is not goodbye but “au revoir”. Past Master Peter Keens responded on behalf of Colin thanking the Master. Finally, many thanks to our Clerk Jollyon Coombs for all the arrangements and making this such a memorable lunch.